I am such a huge fan of Kevin Brooks and I was immediately excited to hear of this latest book, The Bunker Diary, especially as it has been billed as 'Room meets Lord of the Flies.' All I'd really heard about the book before I sat down to read it is that it's pretty terrifying... and while that is definitely true, I also really loved how much this book made me think and the emotion that it stirred up as I went flying through its pages! 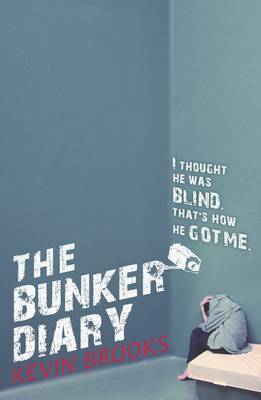 Kevin Brooks is an amazing author, and The Bunker Diary is a very hard-hitting, thought-provoking and scary book! The Bunker Diary is, as the title suggests, told in a diary format. We're told this story from the perspective of a teenage boy, Linus who, though from a wealthy family. has been living it rough on the streets for the past few months after falling out with his father. One day he's helping a blind man lifting some boxes into a van and later, he wakes up in this bunker, having been drugged. The bunker is sealed tight with six bedrooms fully bugged and only one lift to get in and out. It's these first few chapters that I found the most heart-stopping and tense. I felt myself quite easily imagining myself in Linus' position, completely powerless and helpless. He's stuck in a place in which he has no control over, he's completely isolated and vulnerable. The panic that he feels at the beginning is so tangible that I felt my chest constrict in fear and my own heart beat start racing. I did think that perhaps once more characters started arriving to fill out these further bedrooms that things might take a turn for the not-so-scary and thus my enjoyment might fade. But actually, I really liked what the other characters bring to the story. With little snippets of information brought in by the other people kidnapped, I found it hugely interesting to see how differently the media represents the missing (especially in the case of a pretty and young girl) as well as how these people from different walks of life interact with each other and cope with these very difficult circumstances. I wondered if I'd be the type of person who tried to make the best of things, if I'd be the type to hoard food and think only of my own survival and comfort or if I'd be like Linus, constantly thinking of ways to escape and trick The Man Upstairs. And The Man Upstairs is a fascinating character, one that really made me stop and think. It's very easy to read this story as a straight thriller with the choppy sentences and tense atmosphere, but at times, especially with The Man Upstairs, I did wonder if Kevin Brooks really had something a bit more in mind. Not everyone is going to love the open-ended conclusion to The Bunker Diary but I thought it was chilling and intense. This book really got under my skin and gave me chills to read. Amazing stuff. Man, I loved this! I totally agree that the other characters brought interesting dimensions to the story and I was left wondering what I'd be like if I was there as well. I looooove Kevin Brooks, super excited to read his new one! Haven't read a diary-format book for so long! The 'The Man Upstairs' character sounds intriguing! Yes, isn't Kevin Brooks amazing? I'm on a (slow) quest to read his entire backlist.